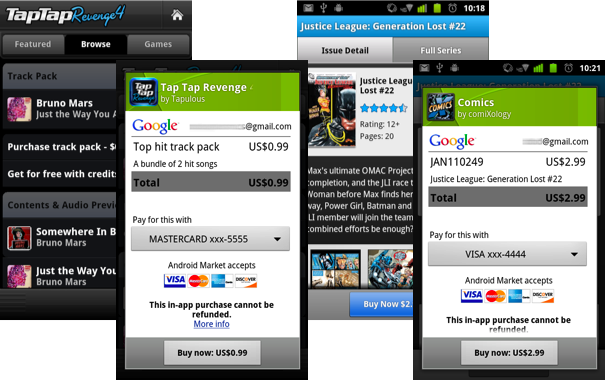 Today, we're pleased to announce the launch of Android Market In-app Billing to developers and users. As an Android developer, you will now be able to publish apps that use In-app Billing and your users can make purchases from within your apps. In-app Billing gives you more ways to monetize your apps with try-and-buy, virtual goods, upgrades, and other billing models. If you aren’t yet familiar with In-app Billing, we encourage you to learn more about it. Several apps launching today are already using the service, including Tap Tap Revenge by Disney Mobile; Comics by ComiXology; Gun Bros, Deer Hunter Challenge HD, and WSOP3 by Glu Mobile; and Dungeon Defenders: FW Deluxe by Trendy Entertainment. To try In-app Billing in your apps, start with the detailed documentation and complete sample app provided, which show how to implement the service in your app, set up in-app product lists in Android Market, and test your implementation. Also, it’s absolutely essential that you review the security guidelines to make sure your billing implementation is secure. We look forward to seeing how you’ll use this new service in your apps!